In the last couple of weeks after all the dramas with the chassis I was filthy on everything but then along came a supplier that reinstalls my faith in the world and puts a smile on my face. The front end of the LS2 motor was turning into a big saga. 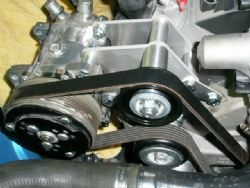 I knew there were pulley kits out there of shining billet accessories and brackets available from Concept One, March Performance Pulleys and Brackets and Billet Specialties. 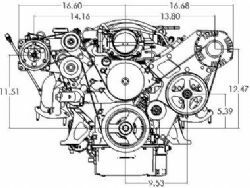 These are great if you are starting from scratch and have very deep pockets as they provide the brackets, pulleys and accessories like a new water pump, alternator, power steering pump and air conditioning compressor all in one kit. On small and big blocks along with the LSX range these kits provide serious bling for the front end of your motor. The investment involved is northward of two thousand greenbacks and if you picked a kit up locally you could have a mild cardiac arrest when enquiring about how much they are. I already had the accessories so I was loath to buy a kit when all I was after was the brackets to support the accessories and have them work properly within the confines of the 57 Chevy engine bay. Back to the internet. Searching, searching, Chevy forums, keyword searches - then bingo. A company I had never heard of before, KWiK Performance Inc. I rang in the middle of the night and spoke to Wayne. I explained my dilemma and he had the solution and better still he could send it USPS. A lot of sites in the US send stuff UPS, FedEx or DHL only and it costs you an arm and a leg. USPS is the United Stated Postal Service and is considerable cheaper than a courier company although they do have size limitations on what they will ship. A week later the new air conditioning compressor bracket arrived. This allowed us to relocate the Sanden compressor from the bottom right hand side of the block to the top. The quality of the bracket, fit and finish was first rate and at US$197 a bargain to boot. Being very impressed with the bracket I was back on the phone to Wayne asking how we can sort out the pulley setup around the alternator. 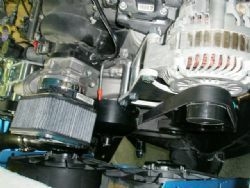 He suggested an alternator bracket mounted high on the left hand side of the block that also incorporated a provision for the power steering pump. To save any future dramas I ordered the bracket and the pump they sell as given Murphies Law my pump wouldn’t fit and I would have to order one, wait... you know the story. By the way, my pump didn’t fit so I backed a winner. The brackets resolved all the front end dramas, fit perfectly and look the goods as well. 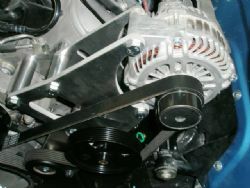 A standard serpentine belt is now running around all the brackets and pulleys and waiting patiently until the donk gets fired up. I’m feeling happier by the moment... Watch this space for what’s next as we battle the loose ends and dramas before it is off to the auto electrician.